Although most of us no longer have to drag our laundry down to the nearest river and beat it clean on the rocks, “doing the wash” is still a time-consuming, ongoing chore. The now-commonplace luxury of having constant access to a washing machine and dryer doesn’t eliminate all the time and effort that go into getting the laundry done: gathering and sorting items to be washed, pretreating stains, loading and unloading the machines, folding, hanging and putting things away — not to mention washing certain pieces by hand, line-drying and ironing. A well-organized laundry center can streamline and simplify your laundering chores. But creating a functional home laundry in a small and/or awkwardly shaped area can be a challenge. Fortunately, there are several innovative products designed to utilize every nook and cranny of limited laundry room space. You could say it’s ironic that so many foldaway storage options have been created for laundry rooms. From pop-up laundry baskets to retractable drying racks to hideaway ironing boards, these savvy space-savers can help you with almost every step from toting to folding. 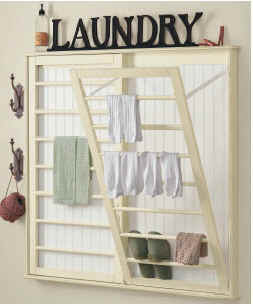 • The Telegant 100 Space-Saving Clothes Dryer ($40; Target stores; www.target.com) functions as a towel bar that cleverly expands into an extended rack with 26 feet of drying space. The towel bar is handy for when you only have one or two items to air-dry, such as damp dish towels. When more drying area is needed, you just flip open the sides and presto — a 21-inch-deep, eight-rail rack pops out and locks in place, retracting easily after your drying is done. Constructed of powder-coated steel and molded plastic, the entire unit measures 40 inches wide by 5 inches high by 2 inches deep when the rack is closed. • Beadboard Drying Racks ($79-$199; (800) 367-2775; www.ballarddesigns.com) are ladder-style hinged racks that tilt out for drying small items, and then for storage simply retract flat against a beadboard-backed frame. Made of solid pine painted with a water-resistant antique cream finish, the 2 3 / 8 -inch-deep racks tilt out 16 1 / 2 inches and are available in three sizes: small, with four rungs (27 inches high by 23 inches wide); medium, with seven rungs (42 inches high by 23 inches wide); and large, which has two racks with seven rungs each (42 inches high by 46 inches wide). The ironing board is another piece of awkward laundry-related equipment that can be challenging to store in an easy-to-access place. There are several types of “space-saving” ironing boards, including travel-size versions that tuck away in a drawer and full-size boards that flip down from a wall or door. A new space-efficient option is the wall-mounted Foldaway Ironing Center ($199; (800) 342-9988; www.solutions.com), which features a folding full-size board designed to swivel 180 degrees so it can be used in narrow spaces such as hallways and walk-in closets. The 43-inch-by-14 1 / 2 -inch board comes with an iron rest and a clothes rack; all three pieces disappear into a cream-colored, molded plastic cover (25 inches wide by 23 inches high by 4 1 / 2 inches deep) that can be painted to blend with your decor. Even if ironing isn’t part of your regular routine, folding your laundry probably is. Although ideally your laundry area should have an optimum-height surface for folding, if you don’t have space for a table or counter for this purpose, it’s OK to use the top of your washer and dryer (assuming you clean the surface before placing freshly laundered items on it). But a neater option is the aptly named Folding Surface Kit ($40; (866) 752-8040; www.creativespacesusa.com). This foldaway counter ( 3 / 4 inch thick by 36 inches wide by 20 inches deep) supports up to 150 pounds and attaches to the wall — at almost any height you choose — with locking brackets that adjust to three positions. A convenient one-hand release mechanism allows you to flip up the counter while you juggle an armload of laundry. The unit also features rounded corners and an easy-to-clean white laminate surface. The typical American has an average of eight laundry products, including three types of detergent, two kinds of bleach, and various fabric softeners and stain removers. Laundry rooms often include cabinets or shelving for storing these supplies. But if your available wall space won’t accommodate shelves and cabinetry, the rolling Laundry Storage Caddy ($30; (800) 221-6771; www.homefocuscatalog.com) is a useful alternative. Designed to fit in the narrow space between a washer and dryer, the white laminated-wood cart measures 8 1 / 2 inches wide by 32 inches tall by 24 inches long and has three shelves with side rails to keep supplies in place when the unit is rolled out and back. Many other types of rolling carts are made for laundry room multitasking. A good example is the Whitmor Deluxe Ironing and Laundry Sorter Center ($89; (800) 966-6546; www.walmart.com), which features a three-compartment sorter with removable cotton-mesh bags, a fold-down 29-inch-long ironing board, a holder for your iron and accessories, a clothing bar that holds up to 30 garments, and a shelf for storing folded laundry. Made of chromed steel with locking wheels, the entire system measures 14 1 / 4 inches deep by 75 inches high by 32 1 / 2 inches long (57 3 / 4 inches long with ironing board extended).